I’ve discussed foundations, primers and tinted moisturizers on this blog but haven’t done a roundup on my favorite beauty powders. One of the keys to making my foundation or tinted moisturizer last is to use a good setting powder to make everything stay put. I’ve rounded up my favorites for my sensitive medium-toned skin. Finding a good powder can take time and a lot of testing. Just like foundation, some colored powders look good once you apply it but can end up darkening after a few hours. Others might be too matte and make your face look completely flat. Then there are powders that are too heavy and can end up looking cakey on your skin or feel like it just sits on your skin. When it comes to setting powders, I like both translucent kinds and ones with medium to medium-full coverage. If a powder is tinted but too sheer, I find it can look too powdery on the skin and I’d rather just stick with something that is translucent. I have two favorites for translucent loose powder that I’ve repurchased several times over. First is the Laura Mercier Translucent Loose Powder which is an oil-free loose powder. It has a silky texture and colorless finish. The powder itself looks white but it doesn’t make you look pale or turn the skin white. At my darkest, I am a Chanel B40 and this works when I have a tan. It’s lightweight but you can definitely see a soft transformation on your face once you apply it. This one sets foundation really well without looking too powdery or cakey. It’s also good for my sensitive skin, doesn’t irritate my face or emphasize pores. My next favorite is the NARS Light Reflecting Loose Powder. This is another colorless powder that has contains what NARS calls a Light Reflecting Complex which optimizes light-reflection on the skin. It doesn’t add any visible shimmer or glow but it sets the makeup really well and once applied it melts into the skin and photographs really well. It does help to blur any lines or pores but won’t make them disappear completely. This gives a slightly more matte finish to the face compared to the Laura Mercier but it doesn’t make the skin look flat. I’ve tried and used up a number of loose powders including Chanel, Giorgio Armani, Laura Mercier (Mineral), Becca and Clinique. Loose powder is one of those things where I use up entirely even if I don’t 100% love it as long as it doesn’t irritate or break out my skin. For me it’s challenging to find a tinted loose powder that has enough color or coverage. So many darken or look so powdery on the skin. Laura Mercier made several Loose Powders in Ivory and Beige but it appears they have been discontinued. I am hoping it makes a comeback or is simply being repackaged because Beige was one of the best loose powders I’ve used. The Laura Mercier Mineral Loose Powder is another alternative I’ve used before, it has a pearl finish similar to other mineral powders. In terms of loose mineral powders, the Laura Mercier is the best one I’ve tried, but it’s a bit heavy for my personal preference. surfaces for a natural glow. The shimmer in this one is visible but it’s not over the top and it won’t make your face look shimmery. I typically prefer powder foundation to set my liquid foundation. I know you might think it sounds too heavy, but I’ve really loved the way dusting powder foundation with a brush over liquids gives a flawless canvas to work with. Those who have seen me in person usually can’t tell I’m wearing foundation (which is always a good thing because you don’t want it to look super obvious). My all time favorite used to be Chanel Double Perfection Powder but they’ve reformulated it several times and I’ve found that I am sometimes in between colors. Right now I’m in between Beige 20 and 30. If you can find a good color match this is a really good silky smooth powder that adds the perfect amount of medium coverage. Using a sponge will add more coverage but I prefer applying this one with a brush. It’s a good touch up powder too for mid-day. It won’t cake if you touch up your nose or forehead. My current favorite is the Dolce & Gabbana Powder Foundation in Warm 100. I have alternated between Warm and Tan depending on how dark my skin is, but 100 has been my exact match for a long time. This one covers perfectly and flawlessly. It won’t irritate or break out my super sensitive skin (MAC and Bobbi Brown always break me out). It has a soft velvety finish that doesn’t cake, darken or look overdone while still giving you a decent amount of coverage to even out the skin. I’ve avoided regular pressed powders for a long time because so many just don’t look good on my skin. They look like they sit on the face or alter the color of my foundation. I’ve found three that are phenomenal. The Chanel Les Beiges Healthy Glow Powders are among my favorite. (Review + swatches here). #20 is my match for an all over dusting powder. #30 and #40 are good for subtle contouring or adding color for warmth. These are ultra smooth powders that have a sheer to medium finish that just melts into the skin. I dust with a powder brush to set powder and it gives a sheer smooth finish. The Charlotte Tilbury Air Brush Flawless Finish Skin Perfecting Micro-Powder is as good as pressed powders get. I saw this one applied on my friend at the Nordstrom Charlotte Tilbury counter at the grove. My friend already had some tinted moisturizer on, she just needed a touch up. I watched her skin transform into this amazing airbrushed finish that looked amazingly natural. It evens out the skin but won’t alter the color of your foundation (as long as you get a good match). The only downside is the color selection is pretty limited and there’s a big jump in between the three colors. I use #2 Medium and am a Chanel B30 in foundation. My friend is a Chanel B10 in foundation and was matched to #1 Fair. 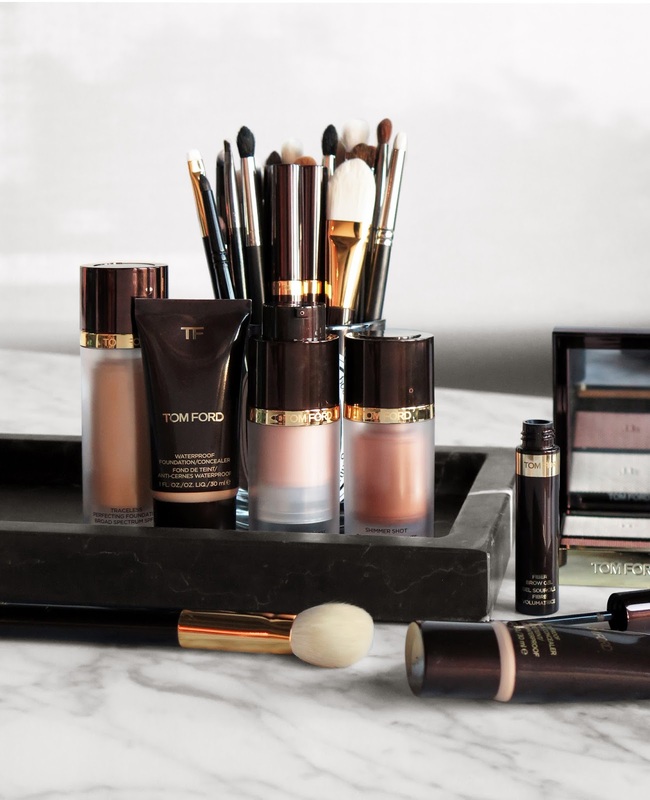 Tom Ford Translucent Finishing Powder is another really good pressed powder. I’ve had this one applied on my face numbers times at the Tom Ford counter and it took me a long time before I was willing to splurge on this one (it’s $77, yes ouch!). My match is Ivory Fawn which looks light in the compact but it has a sheer enough finish to be quite forgiving (I use the Traceless Perfecting in Bisque 4). The only downside (other than the ridiculous price tag) is the color selection is limited. There is a huge gap between Ivory Fawn and Sahara Dusk which is the next shade up. If you are either fair or tan you will have better luck finding a match compared to those of us with medium skin. Once I get tan in the summer, I will be in that gap. For translucent pressed powders, I’ve found most end up looking and feeling too powdery on my skin. The only one I’ve tried and loved is the NARS Light Reflecting Pressed Powder which performs the same way on me as the loose version. It sets the foundation with a sheer finish and gives the skin a slightly matte looking finish. I prefer the loose version because I find it lasts longer on my skin compared to the pressed. I hope you found this roundup of setting powders helpful! As always I’d love to hear from you what your favorites are. Do you have any tried and true powders? Do you prefer loose or pressed?